1. Dependency Injection : Dependency Injection is something AngularJS does quite well. If you are new to Dependency Injection, don't worry, we will discuss it in detail with examples in a later video. 2. Two Way Data-Binding : One of the most useful feature in AngularJS is the Two Way Data-Binding. 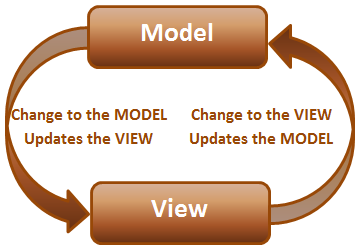 The Two Way Data-Binding, keeps the model and the view in sync at all times, that is a change in the model updates the view and a change in the view updates the model. 3. Testing : Testing is an area where Angular really shines. Angular is designed with testing in mind right from the start. Angular makes it very easy to test any of it's components through both unit testing and end to end testing. So there's really no excuse for not testing any of your angular application code. 4. Model View Controller : With angular it is very easy to develop applications in a clean MVC way. All you have to do is split your application code into MVC components. The rest, that is managing those components and connecting them together is done by angular. 5. Many more benefits like controlling the behaviour of DOM elements using directives and the flexibility that angular filters provide. 2. CDN link - We discussed the benefits of using CDN in Part 3 of jQuery tutorial. 3. Various resources to learn angular - Here you will find videos, Free courses, Tutorials and Case Studies. You will also find API reference which is extremeley useful. 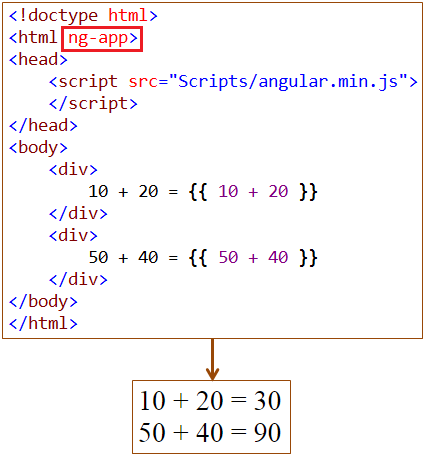 It should be placed at the root of the HTML document, that is at the <html> tag level or at the <body> tag level, so that angular can control the entire page. Double curly braces are called binding expressions in angular. 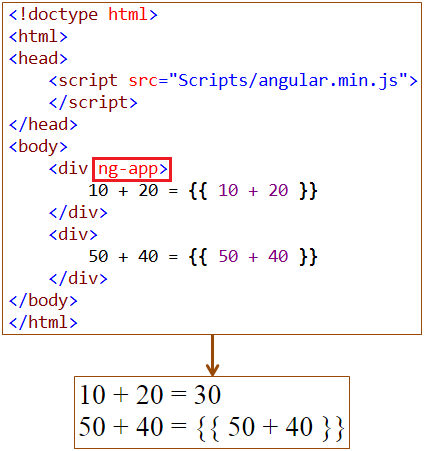 Example : In the example below, the ng-app directive is placed at the <html> tag level. So the binding expressions in both the div elements are evaluated and displayed as expected. Example : In the example below, the ng-app directive is placed on one of the <div> element. So the binding expressions in the <div> element that has the ng-app directive is evaluated but not the binding expression in the other <div> element. u are really doing great job for us. thank you very much. most of people waiting for this angular js series. was Waiting for Angular JS Videos..finally..Thank you sir..You are doing fabulous job..
What version of AngularJS tutorial is this? 1.x or 2.x? Hi Venkat, I'm really appreciate you. I'm new to Angular JS. Currently working on MVC Application. Now want to develop same appl. Appl. front end is developed in DOT MVC & Admin site in Zoomla CMS. or we can say "this is joomla cms driven front end website. Can we developed joomla CMS driven web appli into Angular JS? Hi Venkat , I really appreciate your efforts. Thanks alot. Which version of angular we are using here?